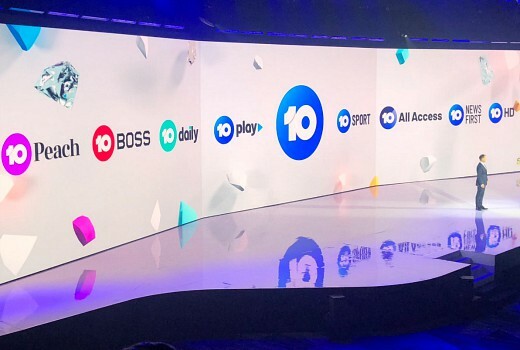 TEN has rebranded as 10 dispensing with all T-E-N lettering at its 2019 Upfronts last night, including the rebranding of multichannels as 10 Boss and 10 Peach. CBS Subscription service 10 All Access will launch in December with 3 original titles plus library episodes. Four shows from Pilot Week get the green light: Trial by Kyle, Kinne Tonight, Taboo and Bring Back Saturday Night. Pilot Week will return in 2019. A newly announced drama series The Secrets She Keeps is a dark tale of two women from very different walks of life who have one thing in common –explosive secrets that could destroy their lives. It joins previously confirmed new dramas, Five Bedrooms, the story of five very different people who meet on the singles’ table at a wedding and decide to buy a house together; My Life Is Murder with Lucy Lawless as Alexa Crowe, a brilliant, insightful, and completely-without-filter investigator; plus new comedy series Mr Black, written by Adam Zwar and starring Stephen Curry and Nadine Garner. New international titles include the Murphy Brown revival, The Conners (Roseanne spin-off) and The Gilded Age from UK writer Julian Fellowes (Downton Abbey). Australian Survivor returns to a Champions vs Contenders format, Poh Ling Yeow, Billie McKay and Matt Sinclair become MasterChef mentors with Nigella Lawson returning, and a shorter season of I’m A Celebrity Get Me Out Of Here! comes with a Live streaming Saturday night edition on 10 All Access. 10 Boss targets women and men over 40 with programming driven by bold, confident characters, while 10 Peach targeting 16-to-39-year-olds looking for feel-good, escapist entertainment. 10 All Access full content library, launch date and pricing will be announced soon. Past seasons: NCIS, Frasier, Cheers, Survivor, Neighbours, The Bachelor Australia, The Bachelorette Australia, The Living Room and I’m A Celebrity Get Me Out Of Here! I’m glad ‘Kinne Tonight’ is getting a series, I loved his show in 7mate. Though I noticed included in the ‘Kinne Tonight’ pilot had some content from his 7mate show. Yesterday morning, i turned on the tv upstairs & noticed that 10 refreshed its logo. I flicked through the epg & noticed that my tv had the old one and eleven channels on my screen. Next, i had to retune my tv to get the 10Boss and 10Peach replacing one and eleven respectively. after 3 mins, i got the new rebranded channels. I watched a tiny amount of B&B encore on 10HD and noticed that the HD bug was missing. Although, i liked the new 10 logo, I found that 10 forgot to put in their hd as of yesterday on Ch 13. I’ve noticed Sale of the Century isn’t listed. Is Sale coming back? No. There were rumours of a pilot reboot but I believe the network was pretty non-committal, and pilot did not happen. Don’t take this as bible but that’s the chatter I heard. I guess if Pointless does not proceed anything is possible. I wonder if 6pm is a great choice for game shows. Is NCIS and LA along with Madam Secretary and other shows like that now going to Boss?? Also why is it only Bull and NCIS that’s listed under returning for International section? From what I read is Boss getting the new episodes of NCIS, LA, Madam Secretary and other shows?? Am I correct or totally and completely wrong?? Returning international shows on 10. We would expect repeats on Boss. So boss is not getting new episodes?? Just realised the logo looks just like the numbers on the SkipBo cards. I’m so thankful that tenplay iPhone app has been replaced with 10play, haven’t been able to watch The Project for months, only ever show Sunday Project available to watch. Full list of shows now available again. IMO, it is okay to change the names – after all, all the other channels have names. It is just that these two names are ridiculous. Choose a name that makes sense (like Flix – as long as you actually dedicate it to movies) and you are fine. Use a nice generic name, like Go, and you are set for a long time and can change your programming however you want. Really surprised there are no comments (or indeed a separate article) on the updated “10 News First” sets, on-air graphics and slightly more aggressive theme music. Clips on Youtube if you missed it. The tacky spinning globe background with the continents marked out by blue stripes is very distracting IMO, and really cheapens the look, feels like something you’d get from a syndicated regional news station that wants to be vague where it’s recorded. The globe also reminds me of the old National Nine News opener of the 80s and 90s. Even the anchors looked a little uncomfortable at the new look. The Adelaide bulletin interestingly tried having the globe static in the background last night, still looks very busy. The actual on-screen graphics are a welcome refresh though, even if the new “10 News First” logo gives the bulletin a more American feel for me. TEN has sent me nothing on this, hence no article. That moving background is a turnoff for me. Hard to watch. Also, what is “News First”? considering everyone else has already covered the same at 4, 4:30, or earlier in the day? TEN rehired Peter Meakin (ex-10, 9 and 7) and first thing he did was reintroduce his “Eyewitness News”. Now someone else thinks “News First” Is more meaningful. LOL. Yeah, I have to say the theme music is terrible, especially during the bulletins in the ad breaks. The music is very rapid and the volume is turned up so loud you can barely hear the newsreader. It’s way too distracting, in my opinion. I love the team…but I can see me deleting my reminder… sadly. We watch lots of channels via the ‘Vast’ satellite system. It is obvious to us, that the larger number of channels on each network, causes them to have to spread their advertisers more thinly and give them more air time. This results in us being hammered by the same adds over and over relentlessly. It absolutely drives us crazy ! Ads for Dubbo butchers in Wollongong. It’s the old thing. More and more channels fighting for the same number of eyeballs. Advertisers demanding either lower rates, more plays, or both. Now we have popup ads. WIN for some “cash track” thing (not the other Cash Cow), Prime and regional Nine for assorted things. Fresh Food Update masquerading as a Woolworths commercial apparently not counted as an “advertisement”. More than 33% of time now commercials, despite what may be claimed. Good to see some news on Murphy Brown but this means again we have months to wait to see the revival, this is still the key problem with international shows on FTA. Others like Will & Grace are available to us at the same time as the US through streaming services. TEN (or is it 10) could have shown the revival before the end of the year with the 13 ep run scheduled to end in December 2018 on CBS.